Hello all, and a very Merry Christmas to you! (or Happy... Boxing Day? Apologies, this post was planned for earlier but I got carried away with festivities and such). I hope you all had a lovely day! I have of course been a bit slack with posting all my Christmas manis... but I have still been wearing them! So once again I will have to resort to a mass post with multiple manis, just like I did on Halloween. But, but but! since it did actually end up being exactly 12, I figured it was meant to be, haha. Enjoy! First off, by far my favorite ultra-Christmas mani I wore this year - Candy Lacquer Mickeys & Mistletoe over Aly's Dream Polish Emerald and Dark Emerald. I just love how the lime green glitters here contrast against the dark green! And of course the Mickey glitter is just adorable. Next up, my picks from the KB Shimmer winter collection. Merry Pinkmas is a baby pink crelly with assorted Christmassy glitters. It was a little sheer on me, so it took about four coats I think? But totally worth it! So adorable :) I actually wore this one for like an entire week - over Thanksgiving, was too busy to change my mani, but definitely a great one to get stuck in for awhile! 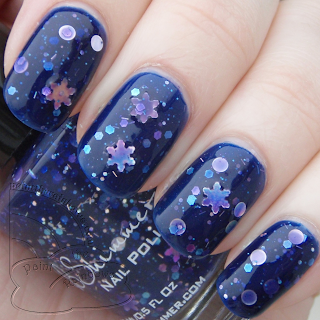 Snow Flaking Way is a blurple jelly with various silver and blue glitters and of course snowflakes! I had a specific dress I wanted to match this one that was a touch bluer than its base, so I layered it over Picture Polish Freya's Cats, a blue jelly scatter holo to blue it up a bit. Love it, so squishy and wintry! 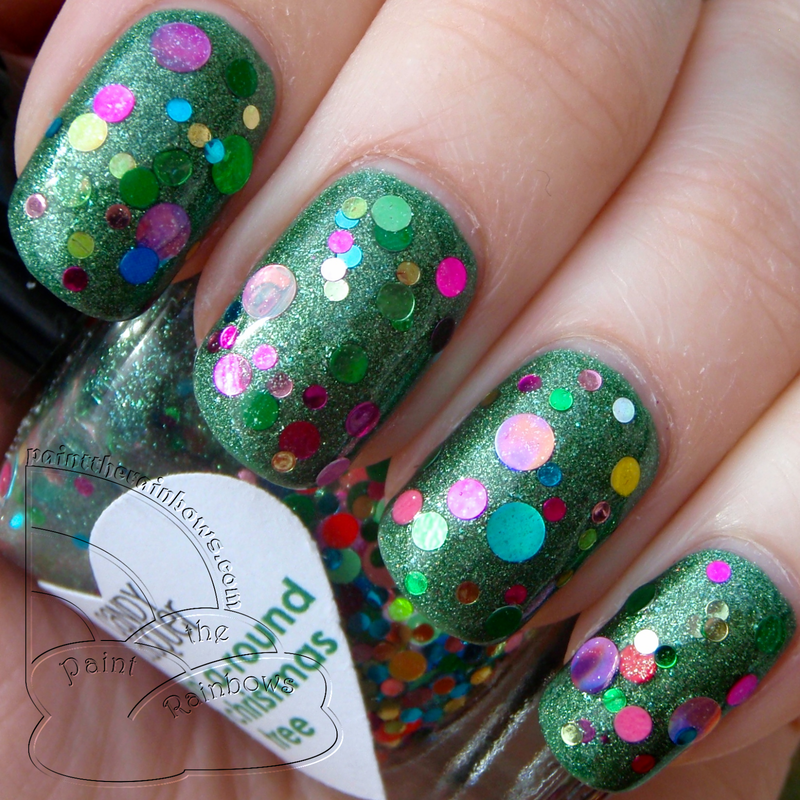 And the last of the KB Shimmers, Christmas Now is a grassy green jelly base with assorted Christmassy rainbow glitters. It was a little sheer so I layered it over Essie Mojito Madness, a grassy green creme. I just loved this one, one of my favorite shades of green! I don't have any pictures I don't think but I matteified it after a bit, and I really loved it that way too. Onto another brand... I actually got a couple more Lynnderella Christmas polishes that I haven't worn yet (one of the new Christmas collection, and I was also lucky enough to snag one of the Advent LEs, w00t!) but have only worn Eleven Ladies Dancing, a mostly red-leaning rainbowy glitter, thus far (P.S. aww, the number 11 just reminds me of the Doctor Who Christmas special tonight :( anyone else watch it?!) But anyway, I layered it over Aly's Dream Polish Bayouberry, a cool sky blue soft scatter holo. Great combo, perfect together! And on to my Dollish Polish picks of the season. I couldn't help loving Dolly's Christmas Vacation-inspired holiday collection; totally my favorite Christmas movie! This one is Jolliest Bunch of A**holes This Side of the Nuthouse, a pink-leaning white crelly with Christmas dots and microglitter. Very cute, love white crellys! Also from Dolly is Merry Christmas... Sh*tters Full!, haha. 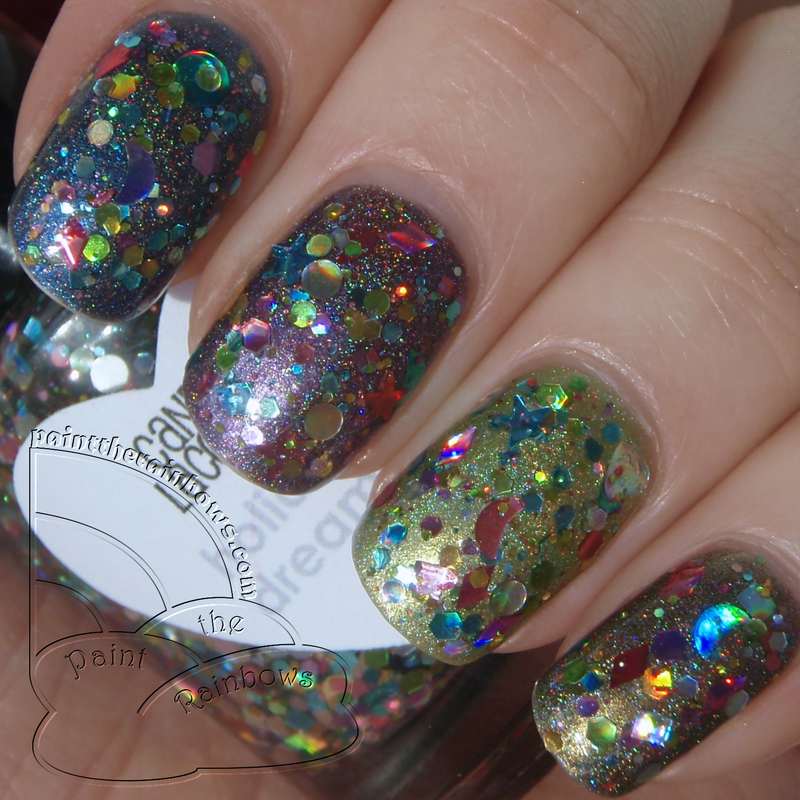 It's a fantastically dense rainbow microglitter, shown here over Aly's Dream Polish Super Black, a blue scatter holo. Seriously in love with this glitter, might be my new favorite rainbow glitter! It looks like rainbow fish scales. 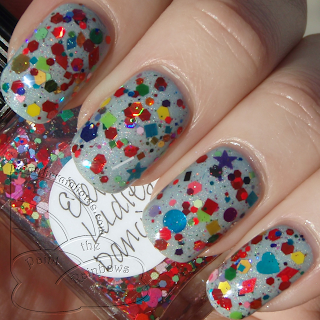 Next up are some lovely Enchanted Polish skittles, both topped off with lovely Candy Lacquer glitters. First is EP Ho Ho Holidays (Chelsea's Christmas collection from last year): Bruised Nutcracker, Dance of the Sugarplum, Green Peace on Earth, and Olive the Other Reindeer with CL Holiday Dreams, a mix of various holo pastel shapes. Super pretty; all the colors went together perfectly! 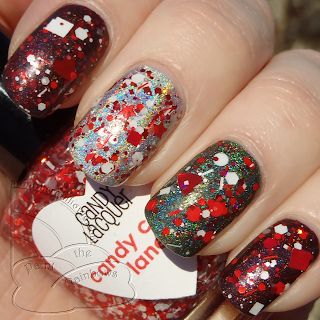 I also did the same idea with EP Holiday 2013, a plummy burgundy holo, Dime Piece, and All Love Garden, an olive holo, topped off with CL Candy Cane Lane, a mix of red and white glitters in various shapes. Looking at this one now I miss it, haha - so festive! The last of my Christmas Candy Lacquers! 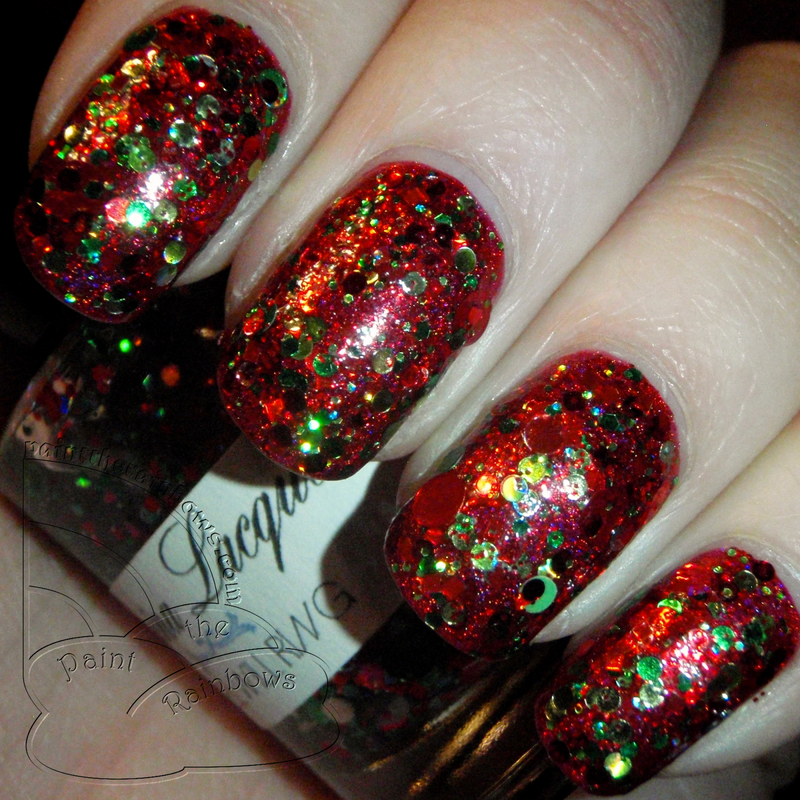 Rocking A-Round the Christmas Tree is a clear base with rainbowy circle glitters and green shimmer in the base. I layered it here over Aly's Dream Polish Emerald. So pretty! Love the abundance of circles. And finally, my actual Christmas mani - the one I am tipwearing into oblivion as I write this post. On my nails for the big day was Colors by Llarowe Man in the Red Suit, a red holo (super holo too, but totally covered up by) Different Dimension Don't Be the Santa of Everything, which is red and green glitters and just about as Christmassy as you get. Apologies for the garbage picture; we were gone about all day today, bouncing around several family members' houses and visiting and I just didn't get a chance to get a good picture. This was crazy sparkly though, just like an ornament! Gorgeous manis! My favorites are all of the Candy Lacquer ones. I have all of them except Mickeys & Mistletoe. I never did get around to wearing them. What pretty Merry Christmas manis.